The 15 km branch will start at Nakheel Harbour & Tower on the existing Red Line, then run on 11·8 km of viaduct with stations serving The Gardens, Discovery Gardens and Al Furjan. The stations at Jumeirah Golf Estates and Dubai Investment Park would be on a 3·2 km underground section, before the terminus at Expo 2020 site. 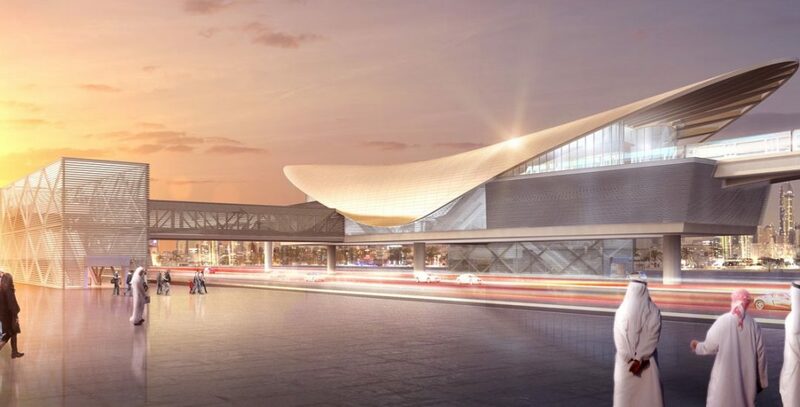 Trial operation is expected to start in the fourth quarter of 2019, with passenger services due to begin on May 20 2020, five months ahead of the opening of the Expo. The journey time from the Expo site to Dubai Marina is expected to be 16 min. Roads & Transport Authority had awarded the contract to build Route 2020 in June to the Expolink consortium of Alstom, Acciona and Gülermak. The 10·6bn dirham contract includes the supply of 50 trainsets, of which 15 are needed for the new line and 35 to increase capacity on existing routes. Thales will provide railway systems. Route 2020 will have capacity for 23 000 passengers/h per direction. Initial ridership is expected to be 125 000 passengers per day, rising to 275 000 by 2030. RTA expects that 35 000 passengers will use Expo station each weekday and 47 000 per day at weekends, making up one-fifth of the forecast number of visitors to Expo 2020. The metro extension forms part of RTA’s strategy to increase public transport modal share from 15·3% to 20% by 2020.